The 65-metre classic superyacht Shemara has been launched from Burgess Marine’s ship-lift facility in Portsmouth Harbour. The 1938 vessel has been towed to Southampton for final fit-out, commissioning and sea trials. Shemara Refit completed the refit in just over three years at the ex-Vosper-Thornycroft yard in Portchester. Burgess Marine provided specialist support and personnel to Shemara Refit for structural and fabrication works, mechanical works and pipefitting. 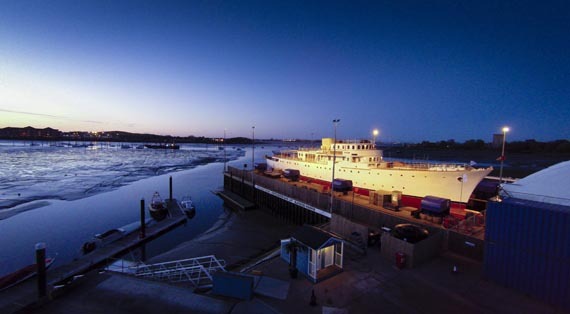 “Burgess Marine has been an important partner in this project from the moment we took ownership of the vessel in Lowestoft in 2010,” says Peter Morton, the owner of Shemara Refit LLP. Burgess Marine’s Portchester facility has seen major investment since the company acquired Testbank Ship Repair in January last year. The channel and syncrolift ‘pit’ have been extensively dredged by Jenkins Marine allowing vessels up to a draught of 4.5 metres to utilise the ship lift. In line with further major investment in Trafalgar Wharf, the wires, bearings and winches have all been overhauled and the site’s infrastructure has been significantly improved. Burgess Marine and Laurent Giles recently unveiled renderings of the 80-metre Project Nelson, which they describe as a modern, superyachting take on the gentleman’s motor yacht.